In late 2013, interesting fresh evidence dating back five and a half millennia was found, giving insights into the enigma of the Mesopotamian clay balls. 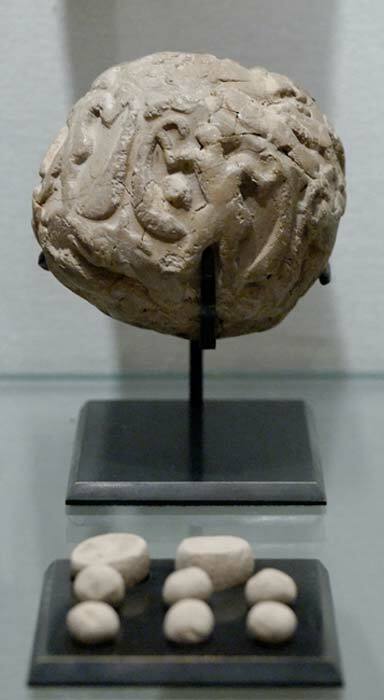 Through use of CT scanning to peer into the clay balls, the study came to a revealing conclusion that the balls may in fact illustrate the world’s “very first data storage system”. After their discovery in the 1960s at Choga Mish site, Iran, the purpose of the 150 balls which were of varying size (from golf ball to baseball) initially confounded the finders and researchers alike. Being found in what had been an area of successful and civilized cities, it was proposed by many that they were some method of recording economic transactions. This conclusion was based on an analysis of a comparable 3,300-year-old clay ball found at a site in Mesopotamia that held 49 pebbles and a cuneiform text containing a contract commanding a shepherd to care for 49 sheep and goats. With no further evidence, this theory remained just one possible explanation for their use and function. Even if this hypothesis proved correct, it was still unclear exactly how the balls would have worked to record the exchange of commodities in prehistoric times, at a time when writing was absent. Was This Giant Stone Sphere Crafted by an Advanced Civilization of the Past or the Forces of Nature? In a search for answers, the researchers peered deeper into the clay spheres. They used high-tech equipment and 3D modelling to look inside the balls and found that they consisted of what appeared to be tokens in a variety of geometric shapes. They concluded that it was possible that the shapes conveyed numbers used in counting different types of products which were exchanged. That being the case, it may be possible to work out the meaning of each of the 14 distinctly shaped tokens by analyzing how the different token types were situated relative to each other. One of the clay balls, now also referred to as ‘envelopes’, was shown to contain anomalies in that some of the tokens it contained had been prepared differently, first being wrapped in cloth before being put inside the ball and also having a bitumen-type liquid poured over them. It seems that these were all methods used to protect the information from being tampered with. Could the Strange Prehistoric Carved Stone Balls Represent Atoms? Another feature of some of the balls was tiny criss-crossing channels, which Christopher Woods, a professor at the University of Chicago's Oriental Institute, believes could have contained fine threads that connected together on the outside. The threads could have held labels, perhaps made out of wax, which reflected the tokens within the clay balls. So you can see, what might appear on the surface a relatively simple object, once exposed became an extremely sophisticated object for the time. As yet the exact significance of each of the tokens and symbols on the spheres is still an undeciphered code. But it is accepted that they are part of an early accounting system that was a precursor to writing and are examples of what are known as bulla or seals . Examples from ancient Near and Middle East.have been found from as far back as the 8 th millennium BC. This is not the only area spheres have been found it is not the only place where similar clay or stone balls have been found. More than 400 carved stone balls were found in Scotland dating back to the Neolithic period between 3000 and 2000 BC, and thousands of baseball-sized clay balls were found in the ancient Neolithic city of Çatalhöyük in Turkey. Is it a coincidence that these artifacts have been found in many countries around the world belonging to the same era? Were they used for the same purpose? It seems there is still much to learn. Read more about Geometric Stone Spheres of Scotland: Part 1 – More Than A Projectile - What Possible Purpose 5,000-years Ago? Dinosaur Eggs, Meteorites, Signs of an Ancient Civilization: What are these Giant Balls? Read more about Dinosaur Eggs, Meteorites, Signs of an Ancient Civilization: What are these Giant Balls?